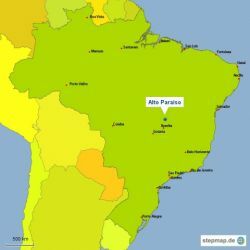 Alto Paraìso is a small village at 1200 m altitude, 230 km north of the capital Brasilia in the region of Chapada dos Veadeiros in the immediate vicinity of the National Park. The lanscape is very charming, mountain ranges are followed by great planes and a vast hydrographical network. In the area, there are more than 150 waterfalls, and numerous pools with crystal clear water. The climate is tropical with an average daily temperature of 25 ° C. The rainy season lasts from November to April, the dry season from May to October. In July and August the nights are cool. 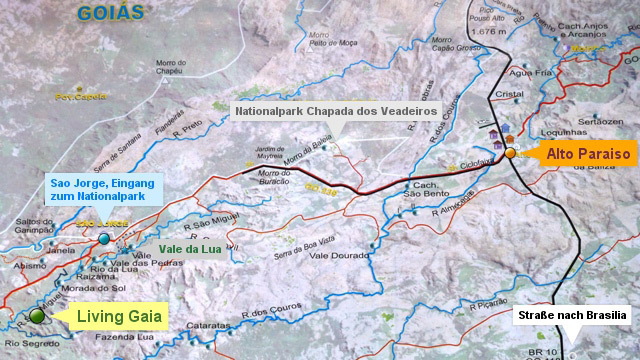 The region Chapada dos Veadeiros is the highest central point of the country and is considered by many indigineous groups to be the birthplace of a new Era. The abundance of crystals in the soil and crystal clear springs create a genuine high field of energy. Environmentalists consider the region as the birthplace of the waters. In the region there are many experimental projects and holistic therapy centres that belonged to the government as well as to non-governmental organizations. This means most people living there want to support a sustainable development of the region. Here are some fotos of this beautiful region. Living Gaia is an area of 240 hectares, 40 miles west of Alto Paraíso, 10 km west of the village of Sao Jorge at the entrance of the National Park. Living Gaia is an area with many hills where two springs originate and open into the river Sao Miguel, which marks the boarder of the land on one side. We have a beautiful presentation of where exactly the land is on Google Earth. Google is also a useful tool to explore the surrounding area. If you are interested, we can send you the file via email - kontakt@living-gaia.org.